While Indian elephants have long been used to carry people on their backs, riding their much larger and wilder African cousins has always been seen as too dangerous. While Indian elephants have long been used to carry people on their backs, riding their much larger and wilder African cousins has always been seen as too dangerous. 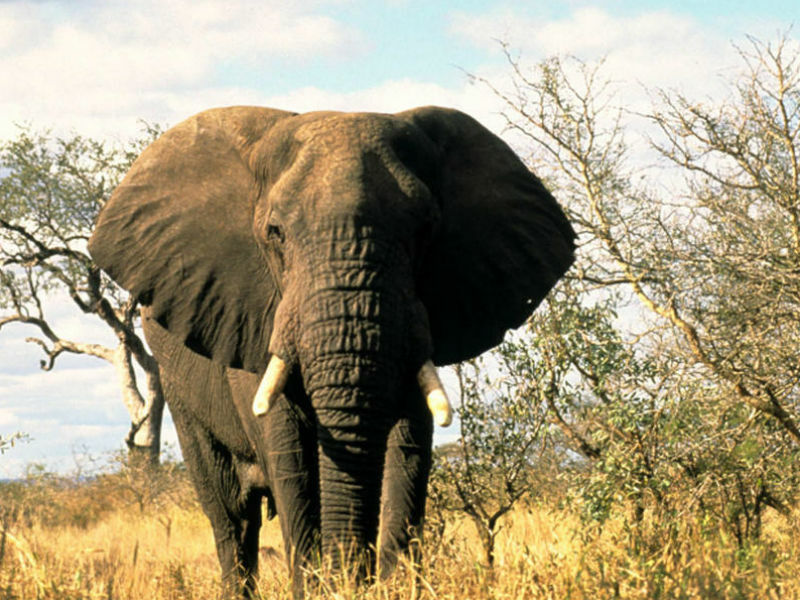 But with tame animals raised by humans, elephant-back safaris are quite safe, and the perfect way to move silently through the bush viewing game. Three South African game lodges offer elephant-back safaris: Camp Jabulani in Limpopo province, Addo Elephant Back Safaris in the Eastern Cape and the Elephant Sanctuary in Gauteng. In 1997 a three-month-old elephant bull was found stuck in a silt dam near Hoedspruit in Limpopo. Discovered by Lente Roode, founder of the Hoedspruit Endangered Species Centre and now owner of Camp Jabulani, the exhausted and malnourished elephant calf was immediately taken to the centre. Roode named the calf Jabulani, meaning “happiness” or “rejoice”, but experts had little hope for his survival without his mother’s milk. But a formula was developed and Jabulani pulled through. Raised in captivity, a attempted reintroduction into the wild herd of elephants on Kapama Game Reserve when he was two years old failed. At five years old the young bull really needed an elephant family when the perfect opportunity presented itself. In 2002, Roode learned of a herd of 12 trained elephants in Zimbabwe whose lives were in jeopardy after the game farm where they lived was invaded by war veterans. Roode bought the elephants, which were moved to the Kapama Private Game Reserve in South Africa. When Jabulani was introduced to the herd, the matriarch Tokwe immediately adopted him as her own. This was to be the start of elephant-back safaris in South Africa, and the luxury six-suite tented camp Camp Jabulani, named after the feisty little bull. The 13 adult elephants – Sebekwe, Mnuyati, Nfuli, Joe, Jim, Setombe, Semopane, Tokwe, Lundi, Fishan, Bubu, Dande and Jabulani – take guests out on daily excursions to the bush. At night the elephants sleep in stables. Guests are seated on a comfortable canvas-covered saddle mounted behind an experienced elephant handler. From this vantage point they are able to view game – antelope, giraffe and zebra – up close as the elephants move silently in single file through the bush. It is also possible to see the Big Five as the reserve contains lions, wild elephant, leopard, rhino and buffalo. Each safari lasts for about an hour and 20 minutes and includes a talk by the elephant master on elephant behaviour before the ride, and refreshments afterwards. Guests mount and dismount from a specially built platform level with the elephant’s back. Elephant-back safaris are available to day visitors too, but for guests staying over at Camp Jabulani safaris are included in the tariff and can be enjoyed both as a daytime excursion and a night safari with spotlights. Guests may have as many rides as they want, but the activity is not available to children younger than 12 years. The 13 elephants can carry a maximum of 18 passengers between them at any one time. In the Zuurberg mountains of Greater Addo – but not affiliated to the national park – is Addo Elephant Back Safaris. At this Eastern Cape lodge guests have the option to walk with or ride the three resident elephants through some of Africa’s most diverse landscapes. Walks with the elephants allow guests to observe their behaviour in natural surroundings, while riding the gentle pachyderms gives an excellent perspective of the area – at a peaceful and gentle pace. Bush, ravines and forest are encountered on each outing, before relaxing at a waterhole while the elephants frolic and swim. There are numerous daily options, from a two-hour morning walk and ride with snacks provided, to a three-hour walk and ride with lunch, an afternoon walk and ride with drinks and snacks for two hours, to a late-afternoon sundowner encounter with elephants, with drinks and snacks provided and lasting an hour. Elephant Sanctuary and Guest Lodge is in the scenic Magaliesberg mountains, just 45 minutes from Johannesburg and Tshwane. The sanctuary lies in natural indigenous bush and is home to plenty of wildlife and about 350 species of birds – and 12 African elephants. Elephant Sanctuary offers guests a comprehensive, hands-on elephant experience that enriches and informs. Mosadi, Moroela, Khumba, Thandi, Jabu, Themba, Mvuso, Kitso, Thaba, Tumelo and Kasper ensure that guests will leave with new-found respect and admiration for the gentleness and intelligence of African elephants. Activities include touching, feeding and brushing elephants, walking with them or riding them through the bush. Guests can opt for a day trip to the sanctuary or overnight in the 10-bedded Indo-African lodge, where all rooms share a common wall with the elephants’ stables.